Welcome to this week's Miscellaneous Tuesday post! To celebrate the newest edition to my furry family I've decided to launch ANOTHER new series that will pop up every once in a while, Pets 'n' Stuff. Can you see a theme here? My furry babies and animals in general are one of my loves and passions and I don't blog about them half as much as I would like to. So in the future I am going to make an effort to include them more. I mean, who doesn't like seeing photos of adorable fuzzies? Anyway! Since to was Rue that inspired this new series I decided the first post would be a wish list of goodies I plan to get her in the future! Some practical things like a new cage and an appropriate sized wheel, as well as some toys and new things I'm going to introduce to her diet etc. 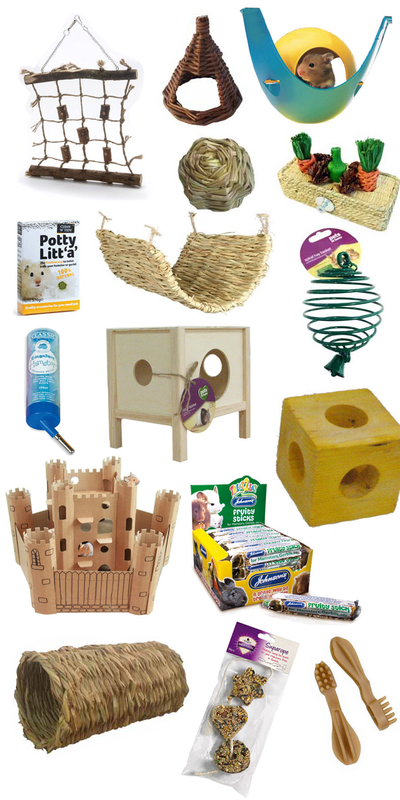 To begin with I am going to show you a Pets At Home wish list which is mostly made up of fun stuff. Although I will name the toys and the prices, I may not actually end up getting these specific toys or brands but look out for something like them. I will have to wait and check sizing and quality in store. On with the wish list! I plan to have a bit of a Pets At Home shopping spree for Rue soon but there are some other things I need or want that cannot be found there. Below is a wish list of those things! At the top of this image you can see the Superpet Silent Spinner wheel. I have already purchased it and I'm waiting for it to arrive. The tiny wheel provided in the cage I have right now was just much too small and I had to remove it. The size I am getting is 12" and is a bit pricy at £21.99 on Ebay. However I have had this wheel in the past and it's true, you get what you pay for. I have also already ordered the cage pictured above which is the Alaska Hamster Cage. It is 84 x 48.5 x 44 cm (L x W x H) in size and therefore much bigger than the cage we could get from Pets At Home. It cost £37.90 on Zooplus and I'm really looking forward to moving Rue into it. Below that you can see some wooden bridges I plan to use in the Alaska cage. I'm hoping to go for a natural and blue theme. The arch cost £1.29 and the hanging bridge cost £1.99 both on Zooplus. On down you can see the LACK coffee table in white from IKEA and Eva had the great idea to use this to keep our cages under so the cats can't sit on top. It is just the perfect size to do so. It is £14. Beside that are some Harrison's Small Animal Corner Litter Trays which were £3.42 on Amazon. I'm hoping to litter train Rue. 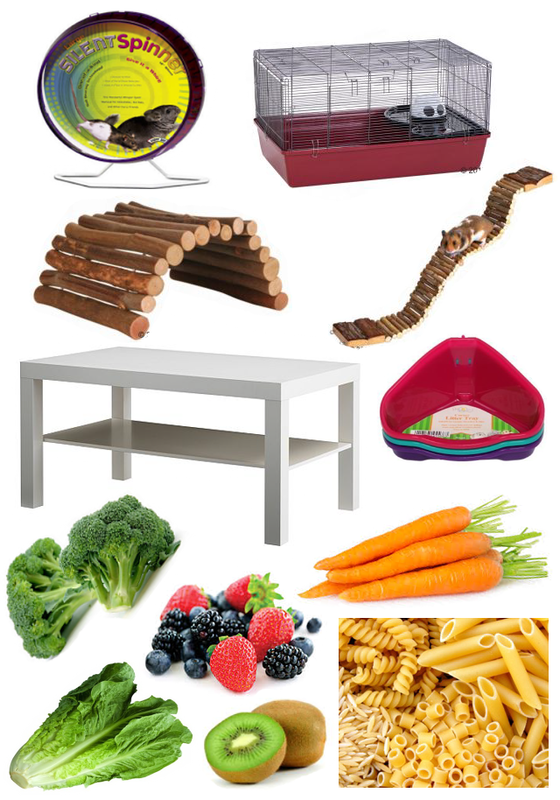 Lastly some food stuff I'm planning to get and introduce to Rue's diet along with meat and a variety of other fruit and vegetables etc. We're just going to start off with some of the basics as she's been living on mix and one piece of kiwi a week so far. So there you have it! Some of the things I plan to get in the coming weeks for my little Ruzi Q! I'm really looking forward to going to IKEA to get the coffee table as I'm sure there will be a lot of other nick nacks I can pick up for her too. I'm also really looking forward to introducing different food to her diet. Anyway, I hope you enjoyed the first instalment of Pets 'n' Stuff. If you have any suggestions for other pet related posts you'd like to see about my pets feel free to leave suggestions! Pets 'n' Stuff | Introducing Rue!